According to Ruchir Sharma, the author of ‘The Rise and Fall of Nations’, among the ten most important things to look at to see whether a country is rising or falling is its talent pool, i.e. is the manpower pool growing? Annually, the World Economic Forum ranks countries on the Global Competitiveness Index — a decent gauge of which nations are best positioned to squeeze efficiency out of their businesses and attract companies and investment from overseas. But if you look beyond the index and examine what countries are actually doing to earn their rankings, the bigger takeaway is that the quality of workforce skills is inextricably linked to economic development. To a great extent, Sri Lanka has yet to reach its full potential in the new knowledge-service based economy. To do that, we must continue to recognise the importance of building upon existing industries that offer potential for future economic growth. Tourism, for example can create 300,000 new jobs by 2020. The sector holds tremendous promise but the lack of skills and manpower will be an impediment to the growth of the industry. Then the construction industry needs over 600,000 jobs to do the Rs. 65 billion worth of construction work by 2020. The same is true of the technology sector with 100,000 jobs. These sectors cannot find the people. We need to selectively open our doors to skilled labour until we build our bench strength. The other challenge we have is if we are to succeed as an emerging economy, Sri Lanka must achieve a balance between a manufacturing-based economy and one driven by knowledge, services, ideas, information and technology. The importance of this pivotal change cannot be overstated. Compared to other countries, our current level of competitiveness is relatively low. But the opportunities before us are limited only by our imagination and our willingness to transform our vision into reality. The task at hand therefore for our policymakers is very challenging but doable. What are required are the political will and the execution. Our schools, colleges, universities and workplaces have the talent and creativity but lack the expertise necessary to make a profound difference in some of the critical areas. Therefore, it is the responsibility of the Government and the private sector to make sure they create the opportunities the country needs to realise its full potential. Sri Lanka is fortunate to have leaders both in the Government and private sector who recognise the importance of investing in education. But Sri Lanka isn’t the only state in the region to realise that investment in education holds the key to economic growth. 1. Immediately identify the skills requirement to deliver the 2025 Vision to enhance the skill level of the current workforce. 2. Support higher education programs that will lead to more graduates with degrees in technology, engineering, sciences and hospitality programs. 3. Increase the number of students prepared to enter the science, services and technology fields, as well as the number of teachers who are proficient in delivery. 4. Jointly identify the skills needed to support the thrust areas and develop three-year manpower plans for each sector. An increase in the amount of pre-seed, seed and institutional venture capital available to emerging businesses, particularly those in the education, technology and bioscience sectors, needs to be seen. 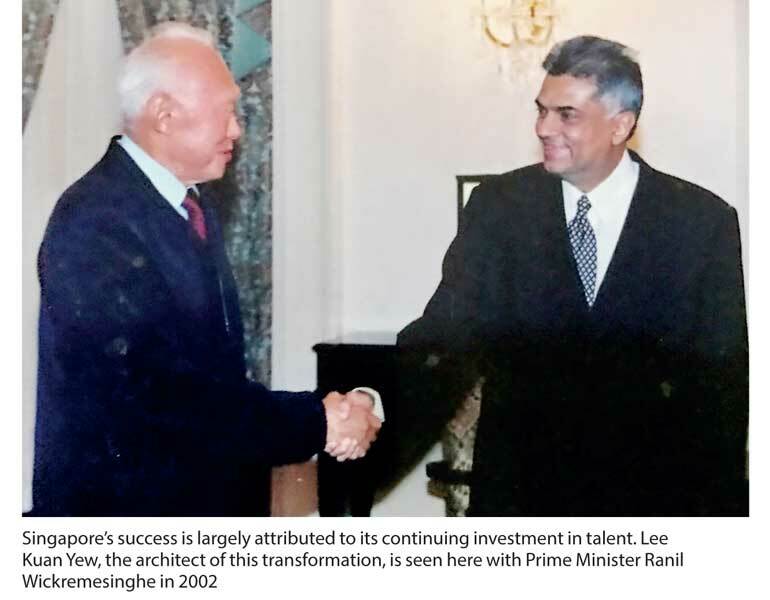 We also need to develop programs and incentives to increase the depth of management expertise and attract Sri Lankan talent from overseas to strengthen our nation’s capability. Today Sri Lanka finds itself in a new economic climate with a new set of rules and a critical need for well-guided investment in higher education and vocational education. We now compete in a global economy that is driven by knowledge, information, ideas and technology. The new Government realises the value of capitalising on our existing strengths. However, as we look to the future, we must explore opportunities and ideas to become more competitive. More than ever before, building people capacity and a talent pool holds the key to our long-term economic success, a key weakness in our current disjointed education and policy framework. Despite a reduction of unemployment rates, a skills mismatch remains between employers’ critical, in-demand skills and the availability of those skills in workers. This is certainly a threat to our competitiveness. (The writer is a HR thought leader).